Thailand is a premier wedding destination | Villa venues by The Signature Weddings. Beach weddings have always captured a certain spot in the imaginations of couples-to-be and more and more people are making that dream a reality by hosting their nuptials in Thailand. Recent years have seen Thailand become one of the premier destinations for beachside weddings worldwide, and with so many venues and beaches to choose from, its easy to see why. Whether you prefer the white sand beaches of Koh Samui, the jaw dropping beauty of the Andaman coast, or something a little more remote on the southwestern coast of Thailand, there is no shortage of destinations to make your wedding one to remember. As Thailand's beaches and resort areas become more and more developed, there are now literally hundreds of options to choose from when looking for the perfect location for your wedding ceremony. Private villas are especially popular, allowing the newlyweds to relax in total luxury after the celebration while enjoying the tropical beauty of Thailand. Many couples opt to make the wedding into a longer holiday as well, spending some time with family and loved ones for the ceremony before travelling around the kingdom for their honeymoon. With so many weddings taking place in Thailand, there is a large support industry already in place. Wedding planners, DJs and live bands, photographers, and more are all available at rates far cheaper than they would in other countries and are all increasingly professional and experienced. Some agencies even offer packages which can be tailored to meet any budget, allowing the couple to truly enjoy themselves instead of worrying about all the details and last minute preparations. Virtually everyone that visits the nation is amazed and delighted at the warmth of Thai people and the high levels of service on offer. These touches can be the difference between a great wedding and an incredible one, and Thailand's hospitable staff remove some of the headaches that accompany weddings held elsewhere in the world. Whatever image you have in your head of how you want your perfect wedding to be, holding it in Thailand can make that vision come to reality, and at a fraction of the cost you might expect. 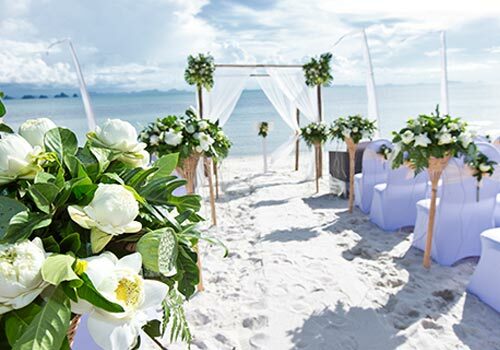 Whether a wedding on the beach with a Western-style ceremony, or even more traditional Thai festivities, agencies and venues in Thailand help you make the best of a destination weddings.